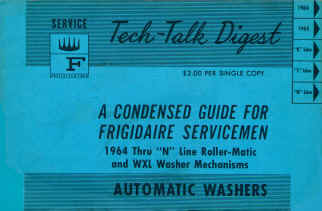 Here's a 24 page "Condensed Guide for Frigidaire Servicemen" that includes photos and specs of each of the Rollermatic transmission assemblies used in these great old 'solid-tub' washers. From the first 1964 'TD' serial numbers with 'Impact' spin clutches (basically non-slip), to the 1968 'N' models (including the famous house-shaking 1010-speed! ), this handy manual includes spin & agitate speeds, running wattages, motor specs, winding resistance readings and harness plug pinouts. Also Loctite and torque requirements, installation spacing gaps for ag. wheel and arm, pump impeller, and part numbers of the most commonly replaced parts in each transmission. Includes specs and pics of the '67 WXL variable speed (I was always happy few of these were sold!). Originally 5-1/2" X 8-1/2", these smaller format manuals ('digests') were really handy for carrying in our service truck. Please note this is a direct, hi-res. scan of the original manual - not a 3rd or 4th 'generation' copy! There are NO SHIPPING COSTS, and No Waiting, because it can be downloaded instantly, straight to your computer! The file is about 9MB in size, a quick and easy download.